We are proud to announce that Millennium Recycling, Inc. is the first company from Sioux Falls to be featured as the cover story in the Global Edition of Recycling Today! 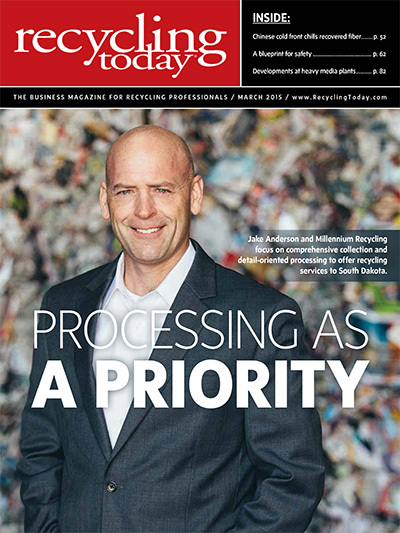 Jake Anderson and Millennium Recycling focus on comprehensive collection and detail-oriented processing to offer recycling services to South Dakota. Jake Anderson prepared for the new millennium not by hiding from potential Y2K catastrophes but instead by taking the risk to purchase an available recycling business and then attempt to help it thrive in the approaching new century. More than 15 years later, the appropriately named Millennium Recycling, Sioux Falls, South Dakota, has grown as Anderson has invested in processing technology and equipment and expanded the company’s menu of services. Anderson’s Millennium Recycling (www.millenniumrecycling.com) has focused on the essential tasks of collecting and processing recyclables that can meet or surpass quality standards while also distinguishing itself with a variety of community outreach programs. By 1999 Anderson had spent just five years in the recycling business, but he was ready to join the ranks of entrepreneurs and business owners in the sector. The business Anderson started out with was modest. “At the time of the transfer of ownership, 6,000 tons annually were being processed through the facility with no outside brokering or trading,” he says. 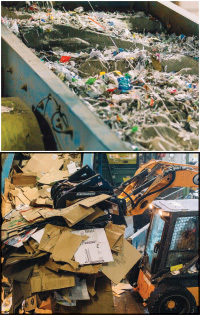 Many of the subsequent decisions that Anderson and his associates have made have clearly worked out, as Millennium Recycling has experienced considerable growth in its 16-year history. The single-stream material recovery facility (MRF) operating at the plant is the heart of Millennium Recycling’s operation, serving customers mainly within a 250-mile radius in South Dakota and parts of adjacent Minnesota and Iowa. “Millennium has become predominantly a single-stream processing facility as the industry has gravitated over the years to that method of collection,” Anderson says. However, Millennium has diversified beyond single-stream commodities. “Early in the last decade, we started getting questions about recycling computers and other consumer electronics, so we decided to dip our toes in that water in order to find out if it was something we wanted to get more involved with,” he comments. More than 15 years into managing his own business, Anderson has had plenty of opportunities to grapple with where to focus his own time and his company’s resources to best position Millennium Recycling to survive and compete. Although the company does broker or trade tons beyond what it processes (unlike the predecessor company it purchased), Anderson says Millennium is first and foremost a processing and packing firm. “With Millennium we do less and less trading and more and more processing, especially given the investments in equipment we have made over the years to sort single-stream material,” he comments. The firm’s foremost investment is in a single-stream processing system supplied by CP Manufacturing, San Diego. The company’s location near the very center of the North American land mass has not prevented it from conducting some direct international trade, both on the buy and sell sides. “Most of the markets we sell to are in the Midwest, but we do ship via rail to areas in the South and to the West as well as periodically export,” Anderson says. As the company’s venture into electronics recycling has demonstrated, Millennium’s sharp focus on operations does not mean it is unwilling to try new things. “We became the first single-stream recycler in the state in 2007, resulting in citywide single-stream recycling [in Sioux Falls] in 2012 after the positive impacts were shown on community participation,” Anderson says. Its careful attention to regional markets also has not prevented Anderson and Millennium Recycling from getting involved in broader issues in its own community. being selected to join South Dakota Gov. Dennis Daugaard in 2013 on a trade mission in China to gain new opportunities for South Dakota businesses in the Chinese market. The most recent addition to Millennium Recycling’s portfolio of community service programs has the potential to create a significant improvement in the lives of some people. “We are just starting a mentorship program to assist new and existing employees who are trying to rebuild their lives due to chemical addiction, incarceration or other hardship,” Anderson says. “Some of these individuals may be parolees, previously homeless, in halfway houses or currently incarcerated,” he adds. When Anderson looks at issues facing Millennium Recycling and the recycling industry overall as his company heads toward its 20th anniversary, he says he sees areas of concern but also expresses optimism in the future of the industry. As obsolete electronics became both a disposal issue and a recycling opportunity, Jake Anderson and Millennium Recycling, Sioux Falls, South Dakota, decided to take a place at the table in the form of a business model that eventually became Bargain Bytes Inc. The pioneering service has subsequently grown in volume to the extent that it split off as a separate business nine years later. Bargain Bytes has become “the first, and only, company in the Dakotas to be certified to both R2 (Responsible Recycling Practices) and e-Stewards,” Anderson adds. Bargain Bytes and its nine employees also provide collection and logistics services plus fluorescent bulb and battery recycling, he says. Among his concerns are political turmoil (“Congress can’t agree on what day of the week it is,” he quips. ), the reduction in paper production of key grades and the future of collection methods. Regarding the recovered fiber stream, Anderson says, “Other than corrugated, the overall reduction of scrap fibers in the commingled stream and the changing composition of a ton of single-stream material” is an important issue. Too many tons of plastic also go uncollected, Anderson says, pointing to “the increasing amount of plastics that are produced and discarded and the economics of how best to recover them” as another issue for Millennium Recycling and industry leaders to tackle. As a small-to-medium-sized operator, Anderson also is keenly aware of the cycles of consolidation that can rock the recycling industry. “I would anticipate there will continue to be consolidation in the industry both in terms of the end users and those that collect and process material,” he comments. “In many instances, scrap material will have to travel greater distances to get to a market, and those changes will affect recycling economics and impact decision-making for businesses and cities, counties and municipalities when it comes to managing waste and recycling programs across the country,” adds Anderson. While these issues affect the way Anderson and his colleagues manage their two companies and plan for the future, Anderson says taking those management steps is one of the keys to survival. “The industry is constantly changing and evolving, and, as a small, independent company in this industry, it’s important to try and stay a step ahead of trends in the business to stay relevant,” he states. In terms of business philosophy, Anderson advocates for management depth. “Surround yourself with good people; one person can’t run any organization,” he remarks. “You need people that you can rely on and empower to help run and grow the business,” he adds. The people who Anderson and his colleagues deal with beyond the Millennium Recycling property are another key priority, he concludes. With the values of careful management and strong personal relationships in mind, Millennium Recycling is poised to protect and expand its market share in South Dakota and, potentially, beyond. There are 0 comment. on "Millennium featured in Recycling Today’s Global Edition"